The Archbishop of York, Dr John Sentamu had a packed weekend of mission in and around New Ainsty last weekend. The Bishop of Selby the Rt Rev John Thomson, Archdeacon Sarah Bullock and Mrs Margaret Sentamu joined this mission and watched the specially formed New Ainsty Deanery Choir in performance at St Mary’s Church in Tadcaster last Sunday. The Archbishop also planted a new tree at Tadcaster East Primary School, pictured, as part of their 40th anniversary celebrations. 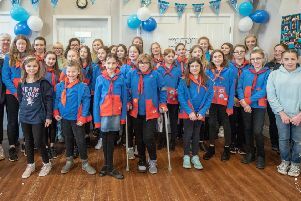 Area Dean for New Ainsty Deanery Rev Geoff Mumford said: “It was part of our plan as the Deanery of New Ainsty to form a choir for such events and now it has become a reality. The New Ainsty Deanery Mission Weekend included visits to local schools on the Friday including Bramham Primary, Tadcaster East Primary, Boston Spa High and Appleton Roebuck Primary. With the Archbishop there was a Big Fun Quiz in Copmanthorpe, a breakfast in Acaster Malbis, a free car wash in Poppleton, Speed Blessings in Tockwith (one to one time with the Archbishop which dozens of people appreciated) and a supper event at Grimston Park. Archdeacon Sarah went to Church Fenton for a Sheep Trail, a Cheese and Wine evening in Askham Bryan and visited open gardens. In addition Margaret Sentamu, the wife of the Archbishop spoke at ‘Divine Diva through the Decades – a themed woman’s event in Tadcaster.